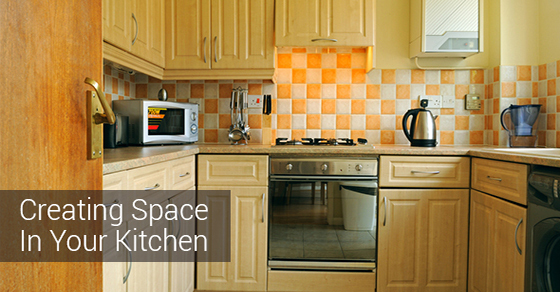 If there’s one place in the house that could use a little more space, it’s the kitchen. Between the pots, pans, drawers, knives and appliances, it’s hard to figure out how to best use the space you have. It’s all about storage and taking advantage of nooks and crannies. These five area savers are a foolproof way to open up your kitchen and create a spacious room you’ll love and look forward to spend time in. Installing an island with foldable sides gives you extra counter space when you need it. This also gives you the freedom to have a convertible kitchen table. If you’re not entertaining guests and are simply having a quiet dinner for two, extending the sides isn’t necessary, which allows you to keep an open and airy space in your kitchen. Stash your dishtowels and settings like placemats or tablecloths in your seats in order to free up space in your kitchen. Bonus: Storing table dressings in your seating also frees up space in your linen closet! A countertop wine rack allows you to store wine safely and out of the way. A cocktail hutch is also quite useful, especially if you tend to cook with alcohol or if you enjoy a drink while you prepare the meal. Both the countertop wine rack and cocktail hutch add a touch of style to your kitchen. An on the wall pot rack, knife rack and/or spice rack will free up your drawers and can be used in even the smallest of kitchens. Make sure to install them at eye level so you don’t have to stand on a chair every time you need to grab the salt. Sometimes we overlook corners because we assume they can’t be properly utilized. Fitting your corner kitchen cabinets with build-in Lazy Susan’s is a wonderful way to get the most out of your space. You can use them to store cleaning products, dry goods, pet foods and other items not needed at the ready. The rotating feature of the Lazy Susan allows you to get what you want quickly without having to dig around your unorganized corner cabinets. Kitchen space is highly coveted, but the aforementioned area savers are perfect for storing everything from wine to pots and pans!